Oh my goodnessss, this pipeable Apple Spice Cream Cheese Frosting recipe is the PERFECT filling and frosting for your fall cakes and cupcakes. If you love all things cozy and spiced in the cool fall months, THIS recipe is a keeper. It’s so easy to make, and ohhh so delish. We especially love it with our Apple Spice Cake recipes! Find our Scratch Version here: Caramel Apple Spice Cake and our Doctored Cake Mix Version Here: Apple Spice Cake (doctored cake mix recipe). 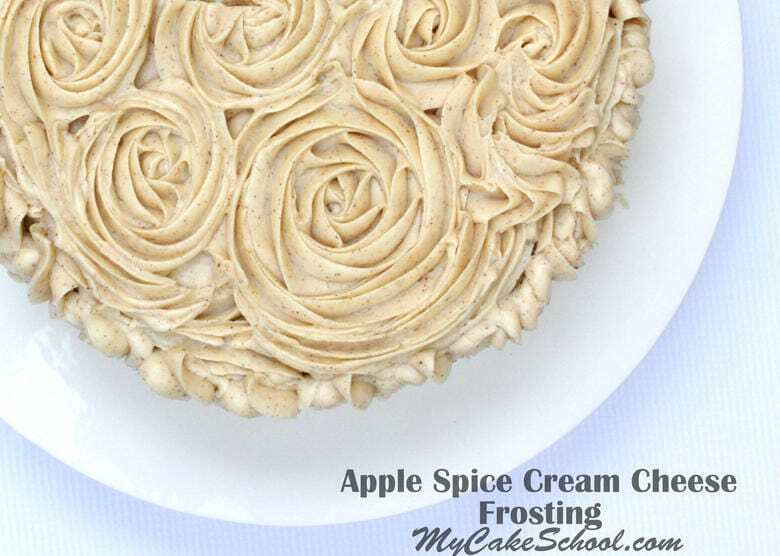 This Apple Spice Cream Cheese Frosting recipe is wonderfully creamy, pipes beautifully, and is flavored with the perfect blend of apple pie spices! You are going to want to dive right into the mixing bowl– it is completely addictive! As long as we’re on the subject of fall recipes, if you are frosting a Pumpkin Cake, a great option is our Spiced Cream Cheese Recipe! So many Cream Cheese frosting recipes, so little time! They’re all certain to make you the dessert hero of the day. SO delicious. Enjoy!! 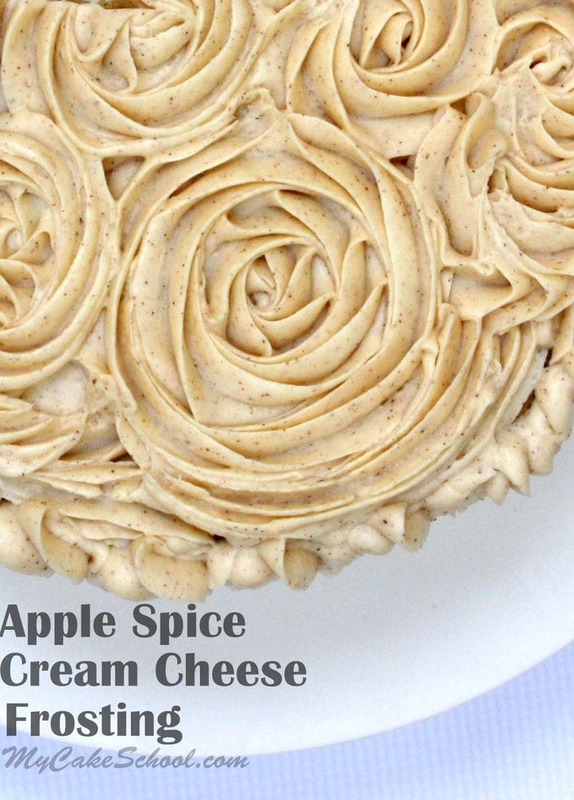 This amazing and easy-to-make Apple Spice Cream Cheese Frosting is so flavorful and is the perfect complement to spice cakes! Put the softened butter in the bowl of your mixer and mix until smooth. Add the powdered sugar, apple pie spice and vanilla. Beat on medium speed for 2 to 3 minutes (longer if using a hand mixer) until light and fluffy. Scrape the bowl mid-way through. Add pieces of softened cream cheese to the mixing bowl. The cream cheese should be soft enough that it combines easily into the butter/powdered sugar mixture. Beat on low/medium speed about 1 minute or until the cream cheese is blended in. Use immediately or refrigerate. If you have beaten too long and it is too soft to pipe, just refrigerate for about 15 minutes and let it firm up again. ** You can make your own Apple Pie Spice by combining: 1 1/2 teaspoon (3g) cinnamon, 1/2 teaspoon (2g) nutmeg, 1/4 teaspoon (1g) allspice and two dashes of cloves, stir to blend. Don’t miss our full collection of favorite cake and frosting recipes in our Recipes Section! You can also find a fun roundup of fabulous Fall Inspired Cakes and Tutorials in our Fall & Thanksgiving Roundup Post! Thanks for stopping by! We hope that you enjoy the recipe!